The Jon Hartman Photography Co.
Our goal is to connect people with the best local experts. 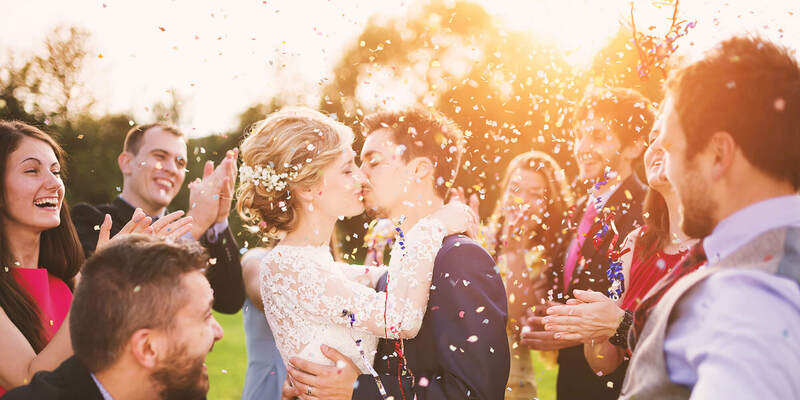 We scored wedding photographers on more than 25 variables across five categories, and analysed the results to give you a hand-picked list of the best wedding photographers in Grand Rapids, MI. A Touch of Grace Photography offers family, baby, maternity, engagement, and wedding photography in Grand Rapids. They love being able to capture the beauty of special moments in their clients' lives and try to take the time to get to know their customers so they are relaxed and able to shine in the images. Located in Grand Rapids, Michigan, and serving the surrounding area, Alicia Heximer Photography specializes in local and destination weddings. The lead photographer is formally trained, and holds a Bachelor of Fine Arts in Photography. She also offers local portrait and live music photography services. Captures Simplicity serves the West, Northern, and Southwest Michigan areas. They have been in business for 15 years, and offer photography sessions such as engagements, weddings, and family, child, maternity, sport, and pet portraits. Chris McGuire Photography focuses on a personal style of photography. Chirs loves finding the authentic moments and does not like to force clients into poses. He seeks the real moments. He offers wedding, events, portrait, editorial, and even commercial photography in the Kalamazoo area and beyond. Christina is a full-service, boutique wedding photographer located in Grand Rapids, Michigan. She specializes in dreamy and romantic imagery in addition to fine art product heirlooms. Her clients value beautiful, tangible photography, and a fun and personalized photography experience. Crystal V. Photography specializes in magazine-style wedding and engagement photographs. She has served customers in Muskegon and Grand Rapids since 2012, and her goal during every session is to capture the story and emotions of her clients. She currently uses a full-frame Canon camera with a variety of lenses for different venues and lighting settings. Darren Breen Photography serves the Grand Rapids area with a contemporary mixture of documentary wedding coverage and dramatic portraits. Darren is a former award-winning news photographer who now focuses on portraits and wedding photography. He uses his journalistic style to tell the story of each wedding using candid photographs to capture the emotions and feelings of the day. The main goal of Face Photography Weddings is to capture the beauty and spirit of your special day with an unobtrusive style. However, the studio offers much more than just capture posed and candid wedding photos. They also photograph engagement sessions, senior portraits, and more. Hannah Cooper Photography serves the Grand Rapids area with vibrant and fun photos. She loves highlighting raw emotions and genuine feelings with her camera and strives to capture the essence of weddings. In addition to wedding photography, the studio offers engagement, portrait, child, and boudoir sessions. Harley Photography's style is fresh, edgy, and a little different from a traditional Grand Rapids wedding photograper. The studio is popular for its inventive and fun wedding day photos. They also offer photograph engagements, business, children, seniors, and families. Kate Morrow Photography offers a relaxed, fun, and natural approach to modern photography in Grand Rapids, Michigan. The lead photographer makes each wedding and photo shoot personal to capture her clients natural behavior and demeanor. She prides herself is capturing images in new and creative ways. Katy O Photo loves the opportunity to share the stories of other people through her photos. Katy says that she comes alive while working on a shoot or event. She specializes in photographing Grand Rapids weddings, engagements, families, babies, and expecting mothers. Specializing in event and wedding photography in Grand Rapids, Lewis Hizer Photography creates striking and fun pictures from any occasion. With a flexible style adaptable to your liking, the studio can capture both vintage and modern photos. Photography packages range from $1,795 to $2,695. Michael Terri Studios has been involved in wedding photography for more than 15 years, with a focus on keeping things fresh and fun. The studio makes sure to be sensitive to the flow of the wedding and work in an unobtrusive style to ensure they do not disrupt the event. For a modern look, a timeless feel, and a fun experience, look no further than Nicole Siembor Photography. Located in Caledonia, the studio offers business portraits, family, boudoir, modeling, trash the dress, and, of course, wedding photography. Nicole also photographs corporate and non-profit events and offers a photo booth for a great addition to any event. No matter the occasion, she will make it fun and memorable. Rachelle Rae Photography loves capturing the love found in other people's lives. The studio's main focus is wedding and engagement sessions. However, the studio also offers family, senior, and photo booth photography sessions. Riversedge Photography specializes in wedding photography in the Grand Rapids area and also offers senior, family, commercial, and engagement sessions. The studio has over 12 years of professional experience and loves capturing special moments with timeless images. Ryan Prins Photography specializes in capturing natural, timeless wedding photos. The studio's style is classic and flexible enough to fit the mood and theme of any wedding. In addition to wedding photography, the studio offers engagement sessions and more. Sarah Pyper Photography specializes in Grand Rapids and destination weddings. According to the lead photographer, no distance is too far. She adores capturing emotion in pictures, which is what she strives for with her photography style. Sarah Pyper Photography also photographs lifestyle sessions, expecting mothers, and family portraits. Steven F Fox Photography loves weddings and being a part of those extra special days. They have been in business in the Grand Rapids area for more than a decade and bring a modern and creative style to your wedding with the goal of timelessly capturing your love story. The Bigger Picture Photography describes its style as photojournalistic with a fine art edge. They experts in capturing candid moments that are also unique and artistic. They specialize in wedding photography in Grand Rapids, but also offer engagements, family, and portrait sessions. The Jon Hartman Photography Co. consists of a husband and wife team that loves using natural light to capture the non-choreographed emotion of their clients. They take the time to get to know their clients and help them relax in front of the lens, so the result is a collection of photographs that properly capture their essence. The People Picture Company prides themselves on providing magazine-style photos that show the uniqueness of their clients. Located in Grand Rapids, they specialize in wedding photography and portrait photography but also offer other types of sessions to meet your needs. Specializing in wedding and engagement photography, Wendi Curtis Photography is also available for destination weddings. The studio has won the WeddingWire Bride's Choice award for three years as well as the Couple's Choice Award for the past two. Her photography style is fun, creative, romantic, and full of emotion. Your wedding day is important, and the lead photographer makes it all about you. With several WeddingWire awards and The Knot's Best of Weddings in 2015, West Michigan Photography has proven that they are more than capable of photographing weddings. The use a candid and photojournalistic style to capture non-choreographed moments. In addition to weddings, they also offer family, senior, and event photography services in the Grand Rapids area.